After many long, long weeks of speculation, the government has finally called Alberta's next provincial election. During campaigns the workload at caucus offices drops considerably, since there are no longer any MLAs; they're all out on the campaign trail (or retiring). So I left a little early today, and on the way out I was lucky enough to stumble across Official Opposition Leader Raj Sherman's campaign truck, affectionately dubbed "the Sherman Tank." 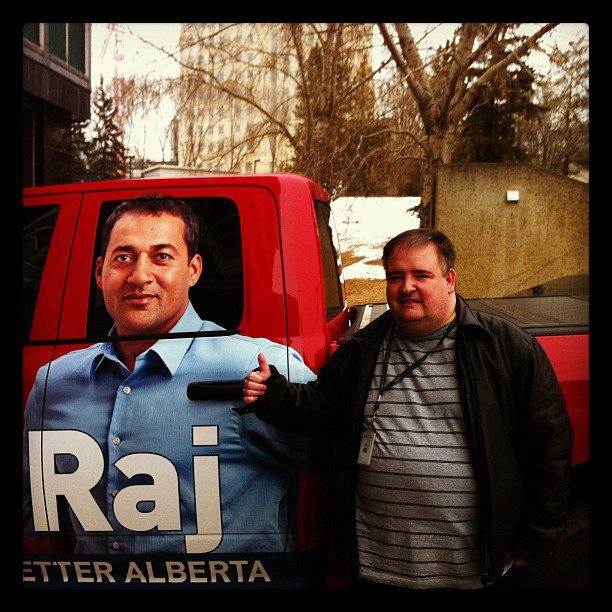 Given my thumbs-up and my work history, it's probably no mystery who I'll be supporting this election (I even live in Edmonton-Meadowlark, Sherman's home constituency, so I'll be voting directly for Raj). But as always the most important thing in any election is that people study the issues and vote on election day - April 23rd. This time around there are plenty of choices; we have traditional parties such as the Alberta Liberals, Progressive Conservatives and New Democrats as well as made-in-Alberta upstarts from both sides of the political spectrum: the Wildrose Alliance on the right and the Alberta Party on the centre-left. The new EverGreen party will be contesting at least a few constituencies as well. I'm painfully aware that many Canadians have grown cynical about politics and that any entreaties I make can hardly be seen as unbiased; my job, after all, depends upon how well the Alberta Liberals do in this election. (Caucus budgets are set according to how many MLAs each party elects to the legislature.) And yet I will entreat anyway: please vote. In 2008, only 40 percent of Albertans bothered to cast a ballot. The fewer Albertans participate in democracy, the more power is focussed in the hands of the few who choose exercise their democratic rights. We all have a stake in governance, and if after reading the various party platforms you still can't put your trust in any of them, well, you can still send a message by spoiling your ballot. Canadians in Sherman tanks fought for democracy in World War II. This spring's election in Alberta is part of their legacy. Let's not let them down. It's hard to get excited or enthusiastic for this election when I'm 90% sure (if not more) that the Conservatives will win in Millwoods yet again, but I want them not to win, and the way to effect that change is to vote for someone else. My only qualm about this election is: do I vote the way I feel most strongly, knowing they won't get elected? Or do I vote the party that has the best chance of winning a seat which is closest to my own beliefs? I don't believe in that whole vote-trading thing and I'm pretty sure I know who I'll vote for; I'm just throwing it out there to see what others (mostly Earl) have to say. It's a legitimate conundrum in our first-past-the-post system, Liam, one I've often wrestled with myself. At the federal level I've voted for both the New Democrats and the Liberals during different elections, each time trying to guess who might have the better chance of defeating the Conservative/Reformer, mostly guessing wrong anyway. Once I've exhausted myself looking into the Conservative platform, then the Alberta Party, I'm going to look into the Liberal Party and see what they've got, including the Millwoods constituent. I don't want to influence your choice in any way, Liam, but the candidate in Edmonton-Millwoods is Weslyn Mather, a former MLA I was lucky enough to work with back in 2006-2008. She's hoping to regain her seat after losing it in the last election, and I can tell you that she's a wonderful human being and an especially fine advocate for children. (Even the Tory MLAs held her in high regard.) I only mention it because Weslyn is one of a handful of candidates I have personal experience with, and I feel she deserves the kudos. Naturally the candidate is only one factor in deciding how to vote, but for what it's worth, Weslyn's a-okay in my books.